McALLEN — The immigrant respite center in central McAllen was crowded Tuesday with hundreds of immigrants, a result of federal authorities running out of room to temporarily hold the immigrants after arresting them, officials said. City leadership, in conjunction with Sister Norma Pimentel — executive director of Catholic Charities of the Rio Grande Valley, which runs the respite center — spent Tuesday looking for other buildings. Pimentel cited Salvation Army and local churches as possibilities to help house some immigrants temporarily, before many of them depart South Texas to meet family members or sponsors elsewhere in the United States as they await an immigration court date, a pivotal step as many of the immigrants seek asylum. In recent days, when the respite center had no more space in its roughly 16,000-square-foot building, authorities, instead of bussing immigrants to the respite center, were dropping off immigrants at the downtown bus station. City Manager Roel “Roy” Rodriguez on Tuesday, along with one of his deputies, went to the respite center and witnessed the hundreds of mostly Central American immigrant families. “We need to find something today,” Rodriguez said just before 5 p.m. on Tuesday, also mentioning the Salvation Army as an additional facility to accommodate the immigrants. Rodriguez added that Border Patrol was over capacity by 2,000 immigrants. This added pressure to find additional space comes at a tricky time for the respite center’s relationship with the city and its commissioners, who in a vote last month ordered Catholic Charities to vacate the 16,000-square-foot former nursing home near the corner of Hackberry Avenue and Second Street due to some complaints from nearby residents. February was the busiest month at the border since 2007 for immigrant apprehensions, and that has not appeared to slow in March. Authorities detained 76,103 migrants, up from 58,207 in January. Apprehension numbers had been rising in the fall, which led Pimentel to relocate the respite center from its small downtown location to the larger location in December. But in February, at a city commission meeting, elected officials intervened. After they heard a couple residents voice opposition, Pimentel pleaded for the Hackberry Avenue location to remain in operation. 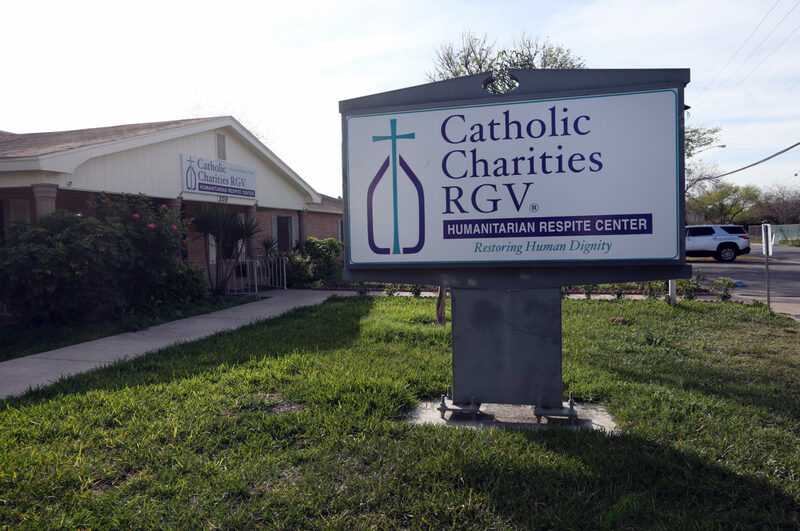 She had been running immigrant relief efforts in McAllen since 2014, and believed action by commissioners at that meeting could possibly introduce an obstacle, she said. In a 3-2 vote, commissioners voted that the respite center had to depart the Hackberry Avenue location within 90 days. “I voted that way to give them time,” Mayor Jim Darling said of Catholic Charities, who was one of the three. Most of the commissioners, in an unusual move, defended their vote. (Two commissioners were absent from the meeting.) A couple days removed from the vote, after hearing plenty of negative feedback, Commissioners Omar Quintanilla and Joaquin “J.J.” Zamora still defended their decision. “We have to look at the big picture and take into consideration the citizens who live nearby,” Quintanilla said. “I feel what I did was right,” Zamora said.